ACCR is "a group that pushed the constitution idea from infancy to where it now has statewide support ..."
Welcome to our chapter of the ASCR, a student chapter of the ACCR, the force behind constitutional reform in Alabama. We are devoted to the idea that people deserve the best government they can design. Our mission is civic, rather than partisan. We seek to engage Alabamians in serious discussion about the future of our state. We want a state constitution that unites, rather than divides our people. We want to create a civic atmosphere in which politics can function for the benefit of all citizens, rather than for a few powerful interests. We want to get beyond fear and suspicion, so evident in our state’s often tortured history. We want to unlock the energy of our people and realize their potential to achieve common goals, such as good schools, responsive government, a clean environment and economic opportunities. Our movement begins with the citizen, who holds the highest office in our democracy. ACCR is about people’s willingness to take control of their civic destiny and achieve the promise that our nation’s founders held up for the world to admire and follow. Please take some time to learn about why we need a new constitution in Alabama. This site is rich with history, politics and civic involvement. 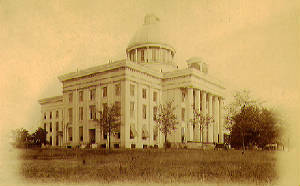 The state capitol building circa 1900.